A Trek to Everest Base Camp in February is adventurous and doable at the same time. It is an ideal time for trekking because of cool temperatures and less number of crowds. It is a shoulder month. February marks the end of winter and the start of the spring season in Nepal. So, you need not worry about the extreme weather conditions during the Everest Base Camp Trek in February. Everest Base Camp Trek is great for landscape photography in February. It is also a bit more challenging due to the snow piled up in the route during the winter months. In February, you can have a great time on your Everest Base Camp trek. It is a great time to admire the amazing winter wonderland. You can leisurely admire the snow covered mountain peaks and lush valleys. 5 reason why you should trek to Everest Base Camp Trek in February? February marks the end of the winter season in Nepal. The first few days of February can be quite cold. Yet, from the 2nd week, the days are quite beautiful and warm. During this month, temperatures range from 4°C to -15°C. At night, it gets colder. Temperatures can drop a few more degrees compared to the day. 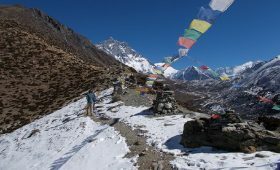 Everest Base Camp trek takes you from altitudes of 1345 m to 5545 m. Thus, temperatures do vary depending on the altitude. The Everest Base Camp route takes you up and down valley and mountains. The lower elevations are warmer, more humid. The higher altitudes have colder nights and mornings. 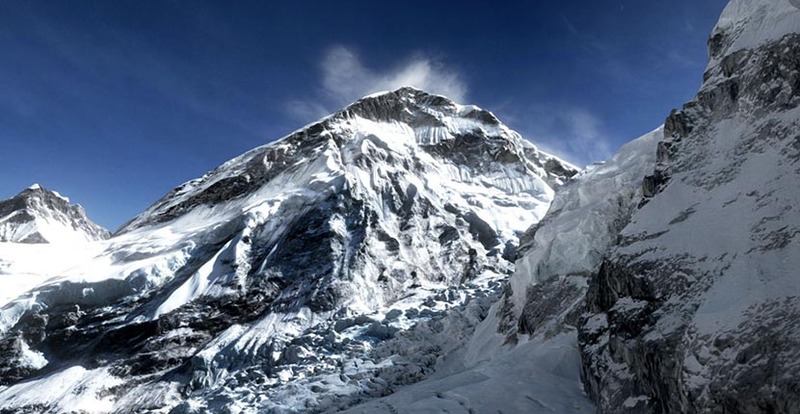 During this period, the wind speed fluctuates from 8 to 12 mph at Everest Base Camp. Although slightly colder, Everest Base Camp Trek in February can be fun and beautiful. There are many routes you can take to reach your destination, Everest Base Camp. With the low number of trekkers and beautiful views, you may opt for one of these routes. If you have limited time, then the direct route to Everest Base Camp Trek in February is ideal. This is an adventurous experience. Your journey begins and ends with an exciting flight to and from Lukla. This direct route takes you through all the major attractions of the Everest region. You will go through Namche Bazaar, Syangboche, Tengboche, Dingboche, Lobuche, Gorak Shep, and Everest Base Camp. Everest Base Camp Trek can be one of the most inspiring walks of your life. This short and beautiful trek also gives you an insight into the lifestyle and culture of the remote Himalaya people of Nepal. You can enjoy the peace and tranquility of the Everest region in February. The Jiri-Everest Base Camp trek is for those who want to skip the flight. Instead of flight, you will walk to Lukla from Jiri. It takes a more rustic route to Everest Base Camp. This is a longer trek and involves a great amount of walking up and down different terrains. You will pass through beautiful alpine forests, glacial rivers. You can also enjoy the hospitality of the locals of the Everest region. You also get a glimpse into the lifestyle and culture of the people, visit monasteries, and stay at local tea houses. This is a short-trek. The Everest View Trek provides a close look of Mt. Everest and other Khumbu mountains without having to walk all the way to Everest Base Camp. This is perfect for those who want to enjoy the views of Everest. However, don’t have the time or the will to trek to Everest Base Camp. 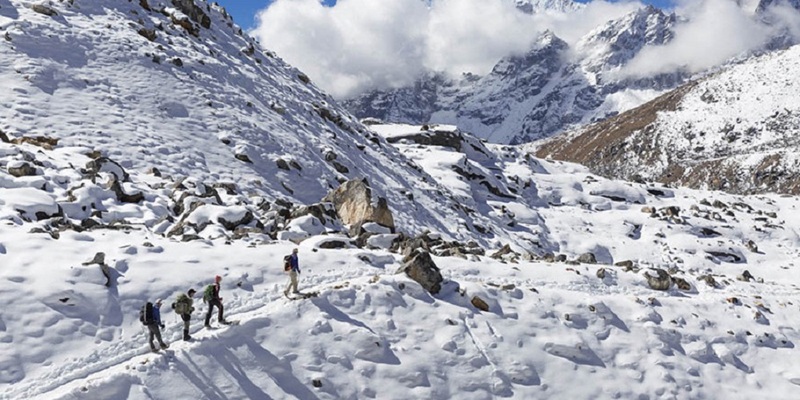 This short Everest Base Camp trek in February offers remarkable scenery. It also offers the opportunity to indulge in the culture, lifestyle of the Khumbu/ Everest region. This is the shortest way to reach to Everest Base Camp. Everest Base Camp Helicopter Tour will take you to Everest Base Camp trek within a day with a helicopter. 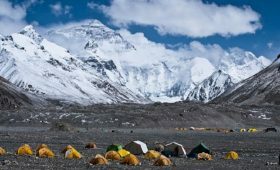 So if you are short in time and want to see the might Everest, you should consider this package. February is not peak trekking season of Nepal. The most popular treks like Everest Base Camp trek are also less crowded during February. Hence, if you want to avoid crowds yet enjoy trekking, February is the month to do so in Nepal. You can trek through quiet and snow-covered trails. You have stunning views of frosty waterfalls. And panoramic views of mountains, gorges, valleys. Nepal is one of the most affordable trekking destinations in the world. Yet, February is more budget friendly. Almost everything drops in price in February. If you love a good bargain while traveling then February in Nepal is the right option. You can find the best bargains on your flights, accommodation, souvenirs, tour/trek packages of Nepal in February. So is the case during your Everest Base Camp trek in February. Some parts of the Everest Base Camp trek are narrow. In peak seasons, there are too many people on them along with animals. Hence, in February it is less risky with the low number of people, animals. Choice of tea houses, rooms. Unlike the peak months, the tea houses, cafes and restaurants is not crowded. Thus, you will not have to rush to get your choice of tea houses, rooms. You can have your pick from the number of tea houses, cafes, and rooms within your budget. Due to the low number of trekkers, you may also get discounts on rooms, extra service. If you don’t like bugs, February is a great month for trekking. Unlike other months, you won’t have to deal with mosquitoes and other insects on February in Everest Base Camp Trek. You will also not find leeches on the trails during this time of the year. In February, the daylight hours are short. Select your route carefully. Make sure you can reach your destination of the day by noon. Trekking in the dark is not safe. Injuries and accidents can and do happen more often during these times. 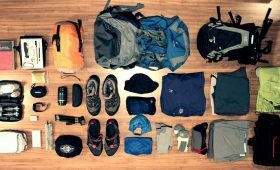 Make sure you go through your packing list for Everest Base Camp Trek. Update your gear where necessary. Also, add in more warm layers and the right boots necessary for the trek. Make sure you have the right snowshoes if trekking during early February. Staying hydrated is key for a comfortable and safe trek. It can be difficult to do so in cold weather in early February. Your water bottles can freeze and drinking water can be a task. Hence, bring a good quality thermos or flask. You can bring different flavors to add to the water to encourage more drinking. February is cold, yet you need sun protection. Make sure you carry the necessary headgear and sunscreen. During the day, the sun is strong in the high altitudes. Along with this, the sun gets reflected off the snow which is brutal for you. Hence, you need to protect your skin, eyes, and scalp from the sun. Make sure you have the right sun hat, buff, sunglasses, sunscreen for it. February is a quiet month in the Everest Base Camp Trek. There is a low number of trekkers to the low number of locals, livestock. Hence, the chances of getting lost, stranded while injured is high. Solo treks to Everest Base Camp is of course possible. But February is not the best month to do so. Make sure you have a professional guide and/or porter with you. They will make sure you don’t get lost. They will also help enhance your trekking experience. From recommending the best tea houses to stay to the local meals to try out, they will have lots of information. They can also help you interact with the locals. You will have to pack all the necessary winter clothes, equipment and gears in February. Hence, your bag will end up heavy. A porter will help with this. The temperatures change due to the change in altitudes and time of day in February. Hence, you will need warm layers for the cold days and nights and light layers for the day. Dressing in layers is ideal for this. You can easily add or remove layers to suit the changing weather conditions. February is a beautiful and cool month to do this trek. Everest Base Camp trek in February is perfectly doable yet, a bit more challenging. 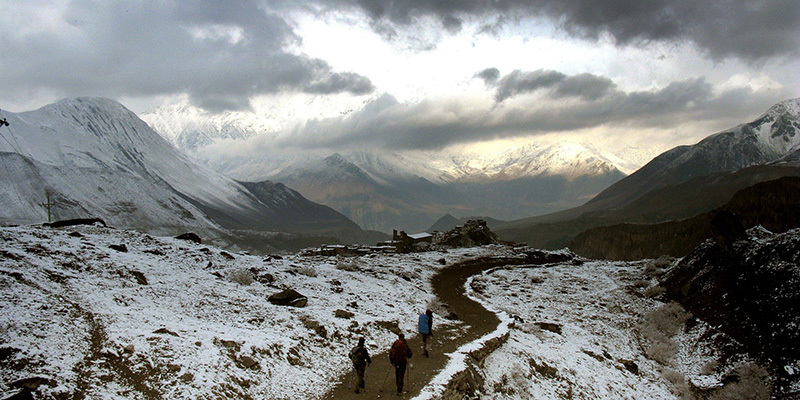 February is an off-season for treks in Nepal. So, you will face the least crowd in the trekking routes, places to eat and stay. Besides this, Everest Base Camp trek provides more challenge in February. Yet it has equally satisfying rewards as well. This trek is possible and doable with proper gear, training, and guides. February is one of the best months to get a better glimpse of clear blue skies, frozen lakes, waterfalls, and snow-capped mountains. You can also spot wildlife and enjoy the beautiful landscape at your own pace. You are free to contact us for more details, queries or questions for any treks or tours in Nepal. What to Expect in Everest Base Camp (EBC) Trek?